I was out in Reading again for work, and being that I had a bad experience at the Peanut Bar last time I visited Berks County, I decided to branch out and see where else I can go to rustle up some good wings. Dinner time was just around the corner, and out of a couple of choices, we ultimately decided on Flanagan’s in Shillington – which as luck would have it turned out to be wing night. Flanagan’s is a local corner bar where, just like “Cheers”, everybody knew each other’s names. This low lit bar is a nice little chatty-hang-out with friendly bartenders, has Wing Night every Monday, Tuesday, Thursday, and Sunday where the 12 wings that I ordered are served at a specially marked priced (this day it was $5.99). This was great because I love eating wings, and I love it even more when they are cheap wings… or should I be more PC and say “Cost Effective” wings. Out of the tons of sauces they carry (Parmesan Peppercorn, Red White & Blue, Sweet & Sour, to name a few) I decided to stick to the Buffalo roots and get the Hot sauce at the suggestion of the bartender. My wings came out tossed in the Hot with a side of Suicide for good measure, and also included a cup of blue cheese with some celery and baby carrots. I tend to like the places that serve both carrots and celery because it adds more variety and color… and I don’t know… it makes me happier. Moving on. Looking over my plate, the wings didn’t look as Jumbo as the menu described, but all-in-all they had a nice red coloring followed by a great aroma so they look appetizing. The only thing I DID need to do was grab some extra sauce because they weren’t really coated too well, and my personal preference is to not have a dry spot on the wing. As I ate, there was nothing that really stood out to have me jumping for joy, and yet there was nothing that made me go in the other direction either. This was a perfect example of the median. When I review wings, I look at what I expect to receive at a bar such as this, and then I decide whether my expectations were or met, were exceeded, or were not even close. Flanagan’s wings were exactly what I expected to get at place such as this, so I am happy with my purchase. 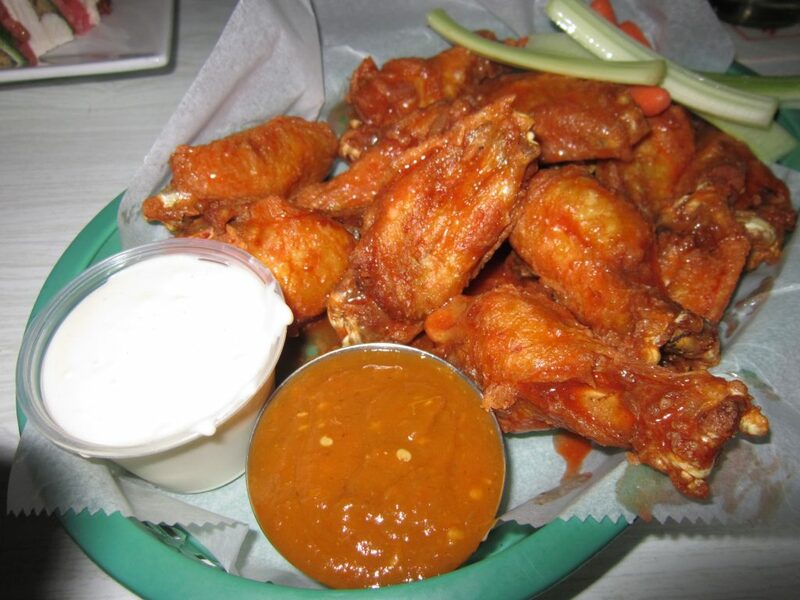 Unfortunately, I’m on the hunt for the greatest wings out there, so I’m looking for a bit more than the norm. The only thing left to try was the Suicide sauce. Let me paint a picture: a cup filled with what looks like an orangy-green paste that smells like fresh vegetables and ready for the dipping. I grabbed the Suicide and poured it over the last wing to see how much it would make me want to take my life. I bit into this wing covered in their homemade sauce, and was instantly transported to when I bit into the Butch T during our last Pepper Growing Video. This sauce was H-O-T Hot! And the weird thing about it was it contained nothing hotter than a habanero. You can taste the freshness of the peppers with the real heat that they bring as opposed to any extract some places use to spice up their stuff. My compliments to the chef on that one. At the end of the day, the wings were nothing fancier than my personal expectations led me to believe, and I was left only satisfied. And though the Suicide sauce was too hot for me, I know that there are a few of you who CRAVE this stuff… so stop in and grab some for yourself ’cause it will leave your lips sizzling.